Happy wedding week to Melissa and Jonathan!!! Hooray! I am so, so excited for these two lovebirds as their wedding day quickly approaches, and it’s going to be such a magical, meaningful, and beautiful day as Melissa and Jonathan are married this weekend! It has been such a joy to get to know them throughout their engagement, and M + J were clearly made for one another! I love how much they complement each other, bring out the best in each other, and have such a strong bond and foundation. 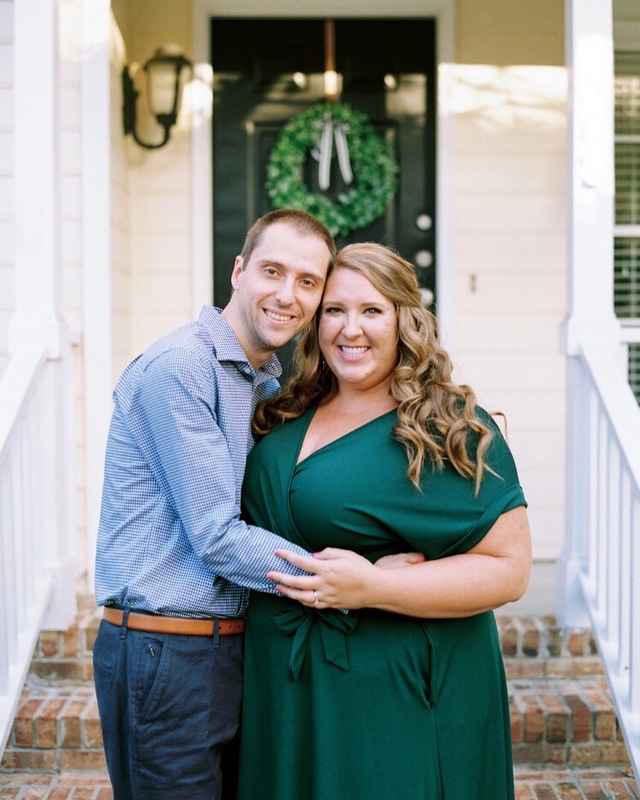 Seeing them together is so sweet, and I love the way Jonathan looks at Melissa (as evidenced in their engagement session by the amazing Megan Kerns Photography!). We had Melissa’s bridal portrait session just a few days ago, and WOW. She is so, so radiant, so breathtaking, and so excited — and I can only imagine how Jonathan will react when he sees her for the first time walking down the aisle. There is already so much anticipation and excitement for their wedding day, and I couldn’t be happier that they’re mere days away from becoming husband and wife! I’m excited to share Melissa’s bride spotlight with you today, where you can learn more about the two of them, their love story, and what they’re most excited about on their wedding day! 1. Tell us a little bit about you and your fiance, Jonathan! We are both dorky, silly homebodies, but we also love doing anything outdoors, going to local breweries, and spending time with my, soon to be our, dog Layla. 2. What are you most excited for about your wedding day? Celebrating with friends and family and starting our lives together. Do you have a moment of your wedding day that you’re most anticipating? Walking down the aisle. 3. What was your biggest inspiration for your wedding design? The venue and playing on the winter theme. 4. Are you doing a first look or saving it for walking down the aisle? Saving it – one of the few things we were in complete agreement on! 5. Describe your style in one word. Classic? 6. What’s your favorite way to relax? Reading. 7. What is something you’re passionate about? Working out/being physically active. What are some things you and Jonathan love to do together? Hiking, camping, anything outdoors and spending time with Layla..
8. What has been the biggest surprise in the wedding planning process? So many decisions! Thankfully Stephanie has helped us narrow those down so much! 9. What is your favorite part of your wedding design? The mix of dark and light shades combined in the flowers. 10. What is your favorite thing about Jonathan? His patience. Stayed tuned this weekend for lots of sneak peeks of their wedding on my Instagram! I already can’t wait to see it all come to life… and then to see how Megan captures their joyous, gorgeous day! Five Years of Stephanie Shaul Events! Today is a very, very exciting day because Stephanie Shaul Events officially celebrates FIVE years of business! Wow!! It’s pretty surreal that it’s been five whole years since I launched this little business… and to see just how far it has come. For the last five years, since January 2014, it’s been my biggest joy and honor to plan, design, and style weddings for dozens and dozens of the most incredible couples imaginable, to be surrounded by love and beauty on a daily basis, to literally work my dream job, to have the pleasure of creating alongside the most talented and kind professionals and friends in the wedding industry, to mentor and coach small business owners, to grow creatively, and to have clients turn into dear friends. I’m SO wildly thankful. I cannot believe that this little dream of mine has become what it is today, and it really does feel so surreal sometimes. I feel like I’m able to use the talents and passions the Lord has blessed me with to serve others well, to spread as much love, joy, and beauty as possible, and to celebrate life and love! I’m so grateful to every single person who has been a part of this exciting journey (especially those since day one), those who’ve encouraged and supported me, and those who have entrusted me with their wedding days. It takes a village, and I’ve got the best one imaginable! I started this business more of a creative outlet, never knowing that just 1.5 after launching, it would become my full-time job. I started with a very basic website, a logo I created in Microsoft Word, two friends who asked me to plan their weddings, and my “office” was my bed at my house in Washington DC. I was single, desperately craving more creative and fulfilling work, and pinched and saved my salary to be able to launch my business (and then take it full time as I moved to Raleigh!). I’ve run 100% of my business debt-free, something I am incredibly proud of – especially since for much of the life of my business, I was single and relying on simply myself to make it work. I definitely think that’s something to be proud of, and I’m so grateful for the ways this business has provided. I’ve shared pretty much all of my business journey throughout the years on this blog (and I’ve linked to many of those relevant blog posts below! ), and it has been such a fulfilling, challenging, wonderful, growth-filled, and beautiful journey. Did you see that I launched by brand new website yesterday?! Head over to stephanieshaul.com to see the heart behind my business and a new face of Stephanie Shaul Events – I couldn’t be more proud of this website and the front porch of my business! Endless thanks for following along and celebrating with me! I am so deeply, deeply grateful, and cheers to the next five years of Stephanie Shaul Events! To God be ALL the glory. Old school: my business branding, logo design – and the reveal! Our own wedding, April 2017! A brand new website for Stephanie Shaul Eventsw, which debuted yesterday! PS: Check back here on Monday for yet ANOTHER super exciting announcement and celebration! !